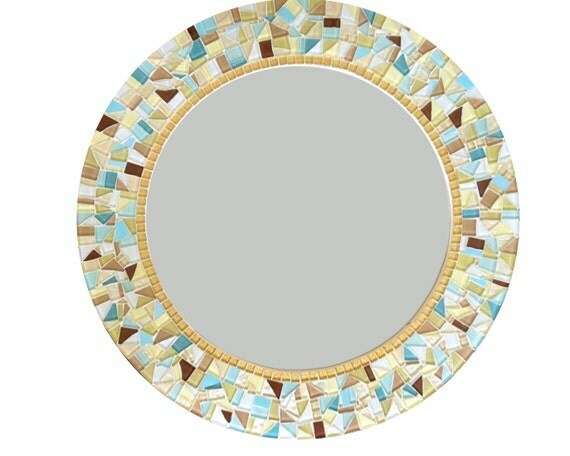 Custom Mosaic Mirror in Yellow, Gold, Aqua, Tan - this decorative mosaic wall mirror features a fun color palette that would look great in a beach house, lakeside cottage, Cape Cod bungalow. The flirty aquas and tans, coupled with gold and yellow with pops of dark brown and turquoise is appealing and unique. Some of the tiles are iridescent, while some have a metallic finish. Pale yellows, bright golden, soft aquas, white, and tans with accents of brown and turquoise. The inside border is gold glitter tiles, which definitely add some bling! This mirror is grouted in white. The sides and back are painted white.